Connector to cable UHV cable assemblies are fitted with female Mil-C-5015 type PEEK 3 pin or 6 pin connectors at one end and either 3 or 6, non-terminated Kapton® insulated wires at the other. The female cable connectors mate directly onto the vacuum side of Mil-C-5015 feedthroughs shown on the previous page. 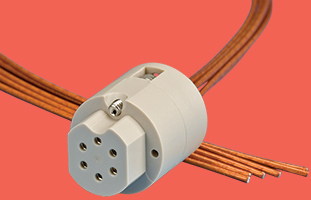 The individual conductors are 18AWG, 10A silver plated copper wire, stranded 19 x 0.23mm, with Kapton® insulation. When assembling connectors, the wires must be threaded through the back part of the connector before contacts are crimped in place.